How often do you have lunch on-the-go? Are you home full time, away full time or just away part time from home? I'm really curious how you all deal with eating lunch. I eat lunch daily which gives me just enough fuel to get through the afternoon and into dinner prep mode. Ever since April when I started my healthier eating journey, I have found that I eat 3-4 smaller, healthier choice meals throughout the day instead of just coffee for breakfast, junk food for lunch and large-not-the-right-foods for dinner. So what does that mean? This means that I shop and plan what I am going to eat for the week. This has to be easy and sometimes on-the-go but if I plan ahead then I eat healthier, high quality and tastier meals. Lunch time varies for me and sometimes I am eating an hour after the "lunch crowd" eats at home. Sometimes when my husband or college girls are home to eat lunch, I run off to gym because that is the only time I have a car to go exercise for the day. Once I get back home for lunch I want something quick, no preservatives, tasty, not high sodium, not a sandwich and around 200-400 calories. I just recently found a quick lunch option that fits this description. It also works as a partial dinner when I'm the only one home. So what is this quick-fix lunch? Believe it or not it is a Barilla Microwaveable Meal! Barilla Microwaveable Meals are quick, easy, tasty, 100% natural ingredients, no preservatives, 320 calories per meal and whole grain. I love whole grain pasta and it is the only pasta that I eat. The Barilla Microwave Meals currently have 5 different variations. 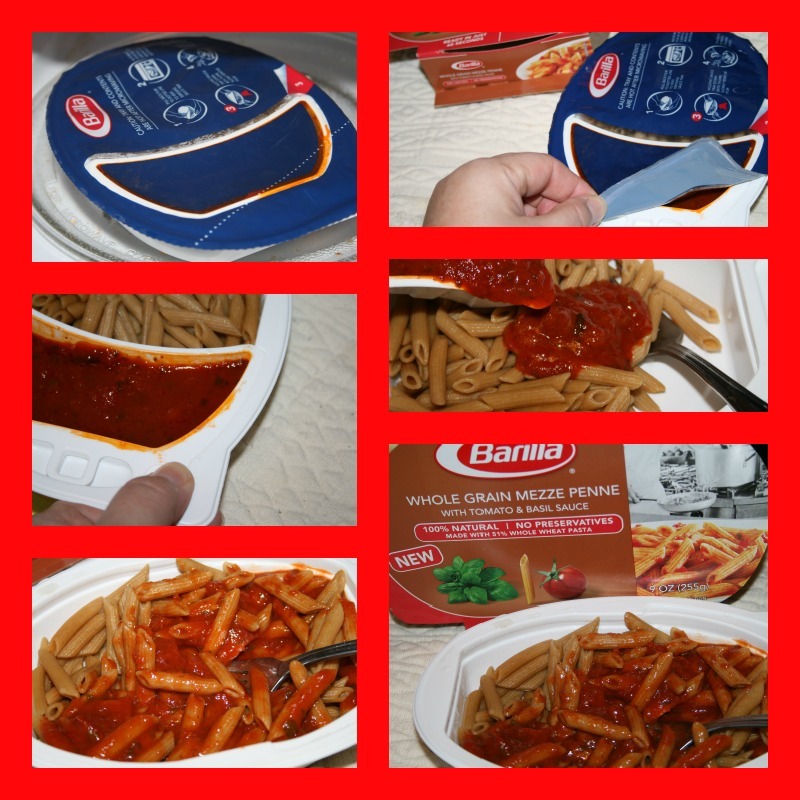 Check out the Barilla website for more descriptions of these meals (and click to get a coupon.) Are you on Facebook? Then click to follow Barilla's facebook page. Mezze Penne with Tomato & Basil Sauce. All the meals are tasty which surprised me because it has been a long time since I have purchased a microwave meal for myself. I do purchase some microwave meals for the kids when they need a quick & easy meal. With these meals, the sauce is warmed up in the same container but separate from the pasta. After 60 seconds you combine the two. The sauce was fresh tasting (preservative free, remember?) and the pasta tasted like I had cooked it on the stove top. Most of all, besides providing me with a perfect quick lunch option, these are great for my growing teen girls. This is a good option for them because they are all-natural, quick to cook and tasty! Thanks to Barilla I have 5 coupons to giveaway! This mean that you can win 1, 2, 3, 4, or 5 free product coupons. Fill out the easy Rafflecopter form for your entries & good luck! I like simple meat mayo and cheese sandwiches. My go to lunch choice is a can of soup or lunchable. Chicken salad and an apple. I'd like to try Mezze Penne with Tomato & Basil. For me. it's a sandwich with grapes or apple and carrots or celery. I'd like to try the Marinara. My go to lunch is a sandwich or a frozen meal. Most days I eat a package of curry noodles. Shameful, I know. I want to try them all, but I'd start with the Mezze Penne Tomato & Basil! I have a blog, but I only post very sporadically.